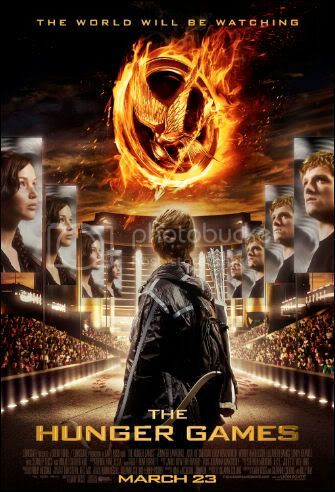 I saw The Hunger Games last night. And just like I expected from devouring all three books in a matter of days, it was epic. It was awesome. And I loved every minute of it. I know people who have debated the finer details of the plot that the book left out or changed. "This didn't happen..." or "Why did they change that?" So many people discredit a movie because it's not as good as the book. That may be true in many places, but in my mind, the book and the movie are two different types of media and can't be transitioned from page to screen. Or vice versa (I've read some novelizations that have expanded upon the original movie and I appreciate the extra insight into characters). So I tend to try and take them as separate entities. Here's why: so long as the original essence of the book is correct and true to its fans, little changes like that have never bothered me. If there's a plot difference that makes you feel differently about a character, or something happens that completely changes how things end, then that's more up for discussion. As it is, I like it when directors bring their own vision to the screen, but it has to be the essence of the source material. Granted, I've never had a book I've written be butchered by a movie, but I'm also not great when it comes to film, as my efforts during school have proved (oh school projects, how horrible you turned out). But, as I see it, movies from books should not be literal adaptations. I'd hate to hear every single thought the main character has or how this thing was just a tiny bit different. If it helps move the plot along, I just don't mind. Many times a book needs to be updated for the current audience. So I absolutely loved The Hunger Games in its own right and I can't wait for the next one, when my favorite character makes his appearance (Finnick, my hero!). I can't wait to see how they treat him. I've always found the first two Harry Potter movies to be the most boring out of the entire eight-movie series. That's because they were absolute literal adaptations of the books, just so it didn't offend any fans. They were overlong and dragged when the plot needed to move along. When The Prisoner of Azkaban came out, it was like a breath of fresh air. Alfonso Cuaron imbued life into the book and made an entertaining movie that never dragged. I won't say all of the movies were perfect in that respect - having characters like Cho in the movies do something she'd never do in the books was a jolt for such faithful adaptations. But they were all overall a good job. Same for The Girl with the Dragon Tattoo. I've only seen the Swedish version, the American version, and read the first book, so I can only speak about the that first storyline (and with a hazy memory). I'd have to say, I liked the American version better. David Fincher put his own brand on it, and while there were some changes, they didn't change the overall outcome. Same for Baz Luhrman's Romeo + Juliet - the story changed somewhat, but the soul was still there. At least I think so. Even Stanley Kubrick's version of The Shining, however different it was from the source material, has its own merit. This is one of the instances where I definitely liked the book better than the movie, but to each his own, right? The movie was spectacular and I did see it before reading the book. It's just one of the those things where I like the medium of a novel moreso than its screen counterpart. The Mist? Yes, it had a different ending, but it felt so perfect, no one really complained. Instances where book to screen transitions didn't work too well for me include Ella Enchanted (oh my God, what they do to it? ), and some others that aren't coming to mind at the moment. If a movie adaptation is going to converge so much, why even give it the same title? Movies have changed their titles from their book counterparts - do that for all those films that will give fans a WTF? moment so we don't have a false sense of security. The only movie based upon a book that I'm afraid to see is David Lynch's version of Dune. The book is my all-time favorite book, and I hear conflicting (and mostly bad) things about its screen adaptation. I'm trying to dredge up the courage to watch it, but it might be one of those instances where I can't separate it from my expectations of the novel. I'll let you know what I think when I do. Honestly, at the moment, there are far more movies that I have more interest in seeing. On a closing note, I saw a trailer for Nicholas Sparks' new adaptation, The Lucky One. Seriously, how does this guy get funding for his movies? I've only seen The Notebook and read the book and I was nearly bored to tears (which was coincidentally when all of my friends started crying during a viewing, so they thought I was going along with it). JUST LIKE EVERY MOVIE FROM NICHOLAS SPARKS, I'M TELLING YOU!! So what if it has Zac Efron?? And with that, good night. At the request of some of my friends, my next blog post will be a departure from the usual fare and will be about my cooking misadventures. I'm a terrible cook. As you'll find out.